You own your career. That’s why it is so important to have a plan for your career growth and transition. It’s easy to get buried in the details of your work. It’s much harder to step back and think about your career aspirations and how you will get there. This week’s roundup features tips and information that will help you manage your job search and career better! 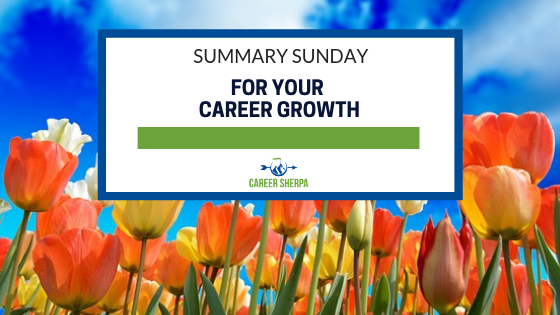 You’ll find ways to uplevel your job search, what not to put in a thank you message after a job interview and even see how to use LinkedIn to research people inside a company. Plus learn how KonMari techniques can be used on your career. I’ve also included 17 things you should know about ATS. Job search takes a long time, especially if you are looking for more senior roles. There are fewer senior jobs and even fewer ever get advertised. Plan on your search taking 6 – 9 months (or longer). And use the tips in this post to maintain your momentum. You know you should write a thank you message after the interview, but don’t just say thank you. Here are things you shouldn’t include in your thank you message. Sometimes you need a video to show you how things work. If you are interested in doing company research, this will show you how LinkedIn’s company pages work! Dropping social media (or avoiding it) isn’t a smart move. See what Dorie Clark recommends and why having an online presence is too important to ignore. If you haven’t heard of Marie Kondo and the KonMari method, you should go check out her show on Netflix to see her in action. Dorothy Dalton walks you through the basic tenets of KonMari as they apply to your career. De-clutter, organize and learn skills that will last a lifetime. Getting Ahead In the World Of Work? Know, like and trust are three words that can drive your career forward. This infographic illustrates why they are so important. I published this article on LinkedIn. Learn how to format and style your resume so it makes it through the applicant tracking system and gets read by a real person!